Shimla along with its scenic views, rich history is also famous for one another thing. It’s food. the city is filled with small colourful Cafés all around, and if you are a food lover, this city is heaven for you. If you are in Shimla, this should be your first stop for food. Easily located because of its yellow colourful windows, wake and bake is perfect for all those who love extra cheese on their food. Any food for that matter. In the picture above, we are trying a savoury waffle which has spinach corn and extra cheese. It was delicious. The best part about this café is the prices are affordable, and the quantity and quality is superb. The café is right opposite the heritage police station building and you can see tourists walking by on the busy Mall Road street while you enjoy your cup of coffee. If you are visiting this café sometime around sunset, then make sure to walk up to their rooftop sitting area to catch the most magical view of the city. Total paisa vasool. Highly recommend! Would you look at that? I might have had to walk one entire hill up and down to burn all that calories, but I would so have it again. In case some of you are wondering what it is, it’s an apple pie with a generous amount of honey drizzled on top of it. We went to this Café purely to check out just how honey was being used in every single dish. My husband had a herbal tea with honey, which was pretty good. I decided to play it safe. Every table in this Café has a big honey bottle just like ketchup in any other restaurant. Beware, your kids can get a crazy sugar high if you take them here. Can’t handle the cold of Shimla? Walk into Café Sol. Their temperature regulated café is perfect for a dinner date. 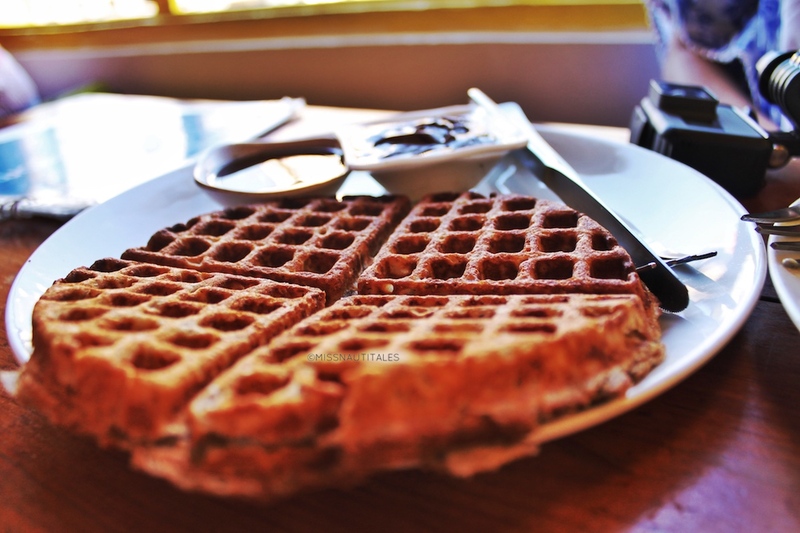 The ambiance is beautiful and you can walk straight out from the Café to a beautiful view of Shimla hills. It is a little pricey for sure, but the pizza we tasted was one of the best pizzas ever. So I would say, it was well worth it. If you want a cool place to hang out with good music, good lighting, and equally good food, then Central Perk Café is a good place to go. We tried their KitKat chocolate cake which was decently good. My favourite was their vegetarian lasagna. I swear, we swiped the plate clean, here’s the evidence. This café is a tad bit steep in its pricing. But the crowd and the feel of the Café more than makes up for it. To be honest, I would probably give them an average rating for their service. We ordered just a plate of pesto sauce toasties and were made to wait for almost 40-45 mins. The upside – the food was pretty good. We didn’t have that much time to spare, so couldn’t order much. But their menu looks quite inviting. So in case you are out of options, you can head over here for an evening snack. Do you know of any other good eating joints in Shimla?